The Finnish phone company wants to see Samsung KO'd in the latest patent fight. 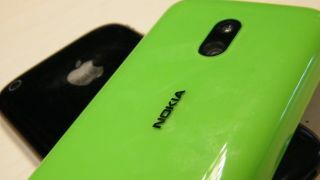 As the Apple/Samsung dispute continues to trudge along, a new player has entered the ring – Nokia. And it's made it clear whose side it's taking. In December, Apple's request for a ban on 26 Samsung devices was rejected, with the court holding that Apple must prove a relationship between consumer demand for the Samsung products and the allegedly stolen features. With the Cupertino company appealing the decision, Nokia has filed a brief to the US Court of Appeals arguing that the judge's ruling could cause "wide-ranging damage to the United States patent protection landscape." While unexpected, this partnership could play a significant role in helping Apple get the permanent injunction it's after. That said, many of the 26 Samsung products, including the Galaxy S2, are no longer on the market. We say unexpected as Nokia was itself embroiled in a dispute with Apple in 2009 concerning the iPhone. However, it's clearly decided to forgive and forget. And let's not forget that Nokia is also a patent heavyweight in its own right, with a lot of intellectual property under its belt.